Occasionally in the course of duties for CW, I get to see some interesting and not-so-standard tow vehicles. Take Volvo’s AWD XC90 for example. It isn’t exactly the most common tow vehicle but, when Parravans’ Steve Edwards loaned us a new Millard Sunseeka, the Volvo came with it. It was fun drive. The 3.2L 175kW petrol engine, coupled to a six-speed auto gearbox, delivered the goods without any drama. The Volvo even has a towing capacity of 2250kg, making it eminently suitable for our Sunseeka caravan, which had a Tare of 1680kg and an ATM of 2080kg. The only slight oddity was the reversing proximity beeper which let fly every time the Volvo came near to the van when reversing – but I’m sure there’s a way to turn it off when towing! 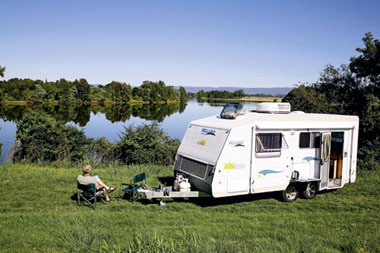 The Sunseeka is built in the standard Millard way, with a hot dipped galvanised chassis that has 150x50mm (6in x 2in) rails and eye-to-eye leaf spring suspension on tandem axles. Our Sunseeka came with classy alloy wheels, and Al-Ko drop-down stabilisers were fitted to all corners. Up front, two 9kg gas cylinders are fitted between the drawbar rails, as are the jockey wheel and handbrake. At the rear end, a 30x30mm bumper bar supports the spare wheel. Like many vans these, days the Sunseeka has LED running lights. Above the chassis, the exterior cladding is profiled aluminum sheeting, the windows are tinted Galaxy hoppers, except for the slider beside the Camec triple-locker security door. In addition to the front boot, there are locker doors on either side at the front which give access to the underbed storage areas. With these types of arrangements, sometimes the awning arm blocks the locker door, but not in this case – there is just enough clearance. The hinged table above the nearside wheels folds down and is large enough for a small picnic. There’s also a powerpoint for the toaster or kettle. On the roof are the Dometic air-conditioner and Winegard antenna. 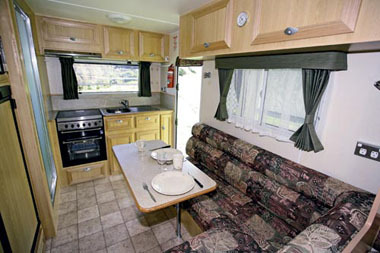 With a body length of 5.38m (17ft 8in), the Sunseeka is not a particularly long van but it does have enough room to fit a front bedroom with two single beds, an offside corner bathroom, a split kitchen, and nearside dinette, while not feeling overcrowded. Decor is the light, timber stain look and all the windows, except those in the kitchen and bathroom, have nets and full curtains. According to Steve Edwards, the popularity of single-bed layouts waxes and wanes. 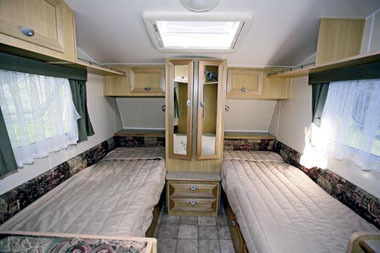 Currently they’re in demand, so there are a number of single-bed layouts in the Sunseeka range, including this one. Both beds have 1.9x0.76m (6ft 3in x 2ft 6in) innerspring mattresses, bedhead shelves and halogen reading lights. Windows on each side and a large Seitz hatch let in plenty of light and crossflow ventilation. There’s no shortage of bedroom storage, either. In addition to the centre wardrobe (complete with hanging space and drawers), there are overhead lockers and a large shelf area. There is not only the usual open area (accessible from both inside and out) under the mattresses, but there are drawers as well. Situated mid-offside in our Sunseeka is a cabinet area with overhead lockers above and a benchtop at waist level. Below the bench are two drawers and two cupboards. The space in one of the cupboards is occupied by the hot water heater. The forward overhead locker also has a mounting point for the swivel arm of a flatscreen TV, which can be swivelled so as to be seen from either the beds or the dinette. An AM/FM radio/CD/DVD player is mounted nearby and electricals such as the 240V circuit breakers, a powerpoint and TV antenna connection are in an adjoining locker. Between the mid-offside cabinetry and the corner bathroom is a Dometic RM2553 150L fridge with a Sharp microwave mounted above. The rest of the catering facilities are found along the rear wall, and comprise a kitchen bench, which has a four-burner cooktop, grill and oven, and a stainless steel sink with drainer and flick-mixer tap alongside. Storage consists of three overhead lockers, two cupboards, one drawer and a small slide-out pantry. Both the rear window and the rangehood above the cooktop provide ventilation, as does the adjacent entry door. An L-shaped lounge with contoured foam cushions provides both the dining and lounging area, although single beds can be used for the latter. Measuring 1x0.5m (3ft 3in x 1ft 8in), the table is mounted on a single swivel arm. Halogen reading lights provide table illumination, as does an overhead fluorescent. There’s also a wall-mounted powerpoint nearby. The corner bathroom includes a Thetford bench-style cassette toilet, corner washbasin and variable-height flexible hose shower. The basin only has a cold water tap but there’s no reason why the flick-mixer-controlled shower rose couldn’t be used for hot water if needed. Both a small wall window and the usual roof hatch provide the necessary ventilation. Millard offers a wide variety of layouts and this mid-range Sunseeka has plenty to offer a couple with a large sedan or mid-size 4WD for towing. Our Volvo (have I mentioned that before?) handled it without difficulty. Its ATM isn’t over the top by any means, yet the van has plenty of features to make around-Australia caravan touring an enjoyable experience.